The Miners path is quite often used as the descent route after going up the Pyg track but is a fantastic ascent path in its own right. 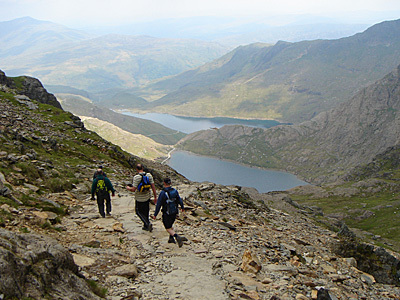 This trek starts with a leisurely stroll along an almost flat well defined path allowing us to enjoy the fantastic views down the Gwynant valley. 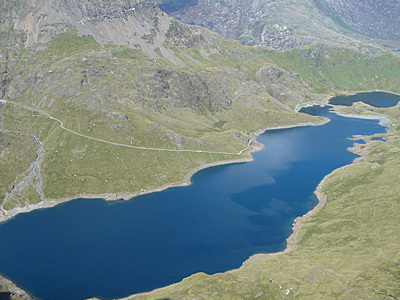 We pass a small lake on the left called Llyn Teryn with the remains of old miners dwellings on the shore, after going around a bend the full beauty of Snowdonia opens up before our very eyes. 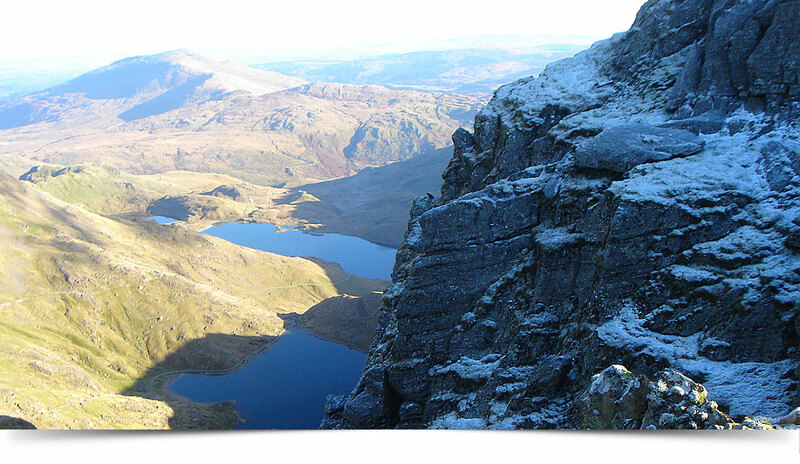 Directly in front is Llyn Llydaw with the imposing cliffs of Y lliwedd towering high above the left shore and the famous Crib Goch knife edge ridge way above on the right. We then cross over a causeway to the far side of the lake with the remains of a copper mines crushing mill owned by Britannia Copper Mine until it finally closed in 1916. Up to this point we haven’t gained much height but this is about to change as we gain height steadily until we reach a lovely lake called Glaslyn with the summit of Snowdon in full view 500 metres above. The fun now begins as we go up a very steep and rocky path with at times loose underfoot conditions until we reach an upright marker stone which signifies we have joined the Pyg track intersection .The height gain continues as we negotiate the zig zags until we come to another two metre high upright stone with the Llanberis path joining from the right. All the hard work has now been done which leaves us to enjoy the fantastic views in all directions as we steadily trek to the summit. This trek starts over rough and rocky terrain which can be slippery in wet conditions in which case you will need to be sure footed. 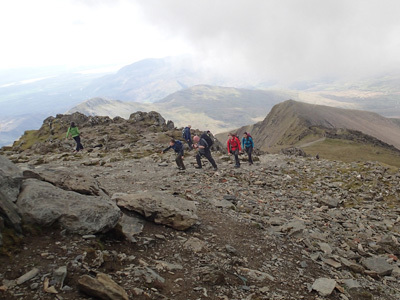 What distinguishes this trek from an easy Snowdon trek is that the path is steep and rocky on a few sections which require the occasional use of your hands to steady yourself. This route is also a lot steeper in parts so previous hill walking experience would be an advantage but certainly not essential. We start this trek by gaining height straightaway over rough and rocky terrain; this soon levels out giving us time to enjoy the wonderful views down the Llanberis pass with Llyn Peris and Llyn Padarn far away at the end of the valley. Straight ahead is what many trekkers mistakenly believe to be the summit of Snowdon but it is infact the notorious Crib Goch knife edge ridge. After another upwards section we go around a corner to be confronted with magnificent views of Llyn Llydaw below us with the towering cliffs of Y Lliwedd ominously rising from the far shore. This view is one of my favourites in the whole of Snowdonia .We then gain height steadily until we come to a small upright marker stone which signifies we have reached the intersection where the Miners path rises from the shores of Glaslyn far below to join our track. The path then disappears in a few small sections which can become troublesome in bad weather but will not be an issue as I will be safely guiding you we then go steeply up the zig zags to another upright marker stone where the views open up dramatically. The Llanberis path now joins from the right. All the hard work is now behind us which leaves us an easy trek to the summit as you reflect on your fantastic achievement. This trek is without doubt the quietest of all the main paths to the summit. The underfoot conditions are straightforward with a few boggy sections. You will need a steady head for heights on this trek as there is a section that requires us to negotiate a narrow and rocky ridge with steep drops on both sides.